The newest edition to the ACID family, Acid Cigarillos are hand-rolled premium cigars featuring excellent blends of Dominican tobaccos infused with 150 unique and flavorful herbs, spices and botanicals. Acid cigarillos produce a bold flavor and pleasant aroma enjoyed by cigarillo and premium smokers alike. Each of these hand rolled cigarillos are crafted to match the sensorial experience you get with the bigger versions of the Acid premium cigar lines. 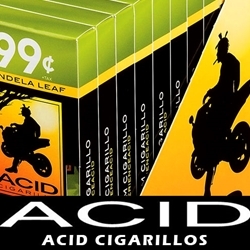 Our online cigar store offers Acid Cigarillos in three special blends for your smoking pleasure. Blue, with its mellow light natural leaf wrapper that gives a sweet and smooth taste. Red, a creation of spicy premium tobaccos accented by floral and zesty spice notes, bolder than the rest of the line. And Green, a bright green candela wrapper covers mellow premium tobaccos gently infused with Acid’s secret blend of exotic herbs and botanicals. Smokers Discounts offers a full complement of the ACID flavor line all wrapped up in a petite package. We’ve made it easy and affordable to buy hand-rolled Acid Cigarillos online. A variety of sizes and flavors are listed below. Each of these styles are in stock and available today for a low discount price. Call us for more details!